Here's some pictures! First, if you follow me on Instagram, you know I got some new greeting cards! They'll be for sale at my next events in August! We accidentally -but kinda on purpose- had a bit of a lizard theme this year, which was really fun! The drawings were done on tagboard and campers created backgrounds using Zentangles or "marker painting" techniques. They lizards were made using Sculpey clay and then painted with acrylics. I love kid art. The two weeks ended with the very nice outdoor wedding of two of my college friends. They were married on a farm near Utica, NY. They seemed to like the Name Design that I gifted to them. I wish them many years of happiness! Congrats Amanda + Greg! Now back to business. The Chalk Art Festival and Billapalooza are this weekend. Play time is over. Time to get back to work! To coincide with the "GONE VIRAL" exhibit at SUNY Fredonia that opens this Thursday [March 7th], students, professors, alumni and community members joined forces to yarnbomb the light posts along the main entrance and Symphony Circle. I highly recommend that anyone in the Fredonia, NY area check it out ASAP! Who knows how long it'll be up! Monsters came out to play in a big way... as a monster totem pole! If nothing else, hopefully this yarnbomb will make some people smile. 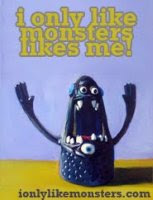 The monsters have a tendency to do that. Here's some pictures! Something Cool is in the Works! For anyone that follows me on instagram, you've probably figured out that there is a cool project in the works! It involves yarn and my favorite alma mater. It's going to involve monsters too. All will be unveiled March 2nd! Since I've directed a lot of my creativity toward this project, the monster making has been slow. But good news, I've applied to some shows and will share where and when they are as soon as I get word that I'm accepted. So, for all y'all that aren't instagramming, here's some of my little sneak peeks of the project. And if you are on instagram and not following me, let's change that! I'm @erinmakesstuff ! PS. Look who finally learned how to crochet?! Here's the latest custom order! A monster walrus! I was super excited to make this guy... and he's so hilarious looking! Enjoy! I also finished a monstapus today. The walrus monster and monstapus became friends quite quickly! I've had the idea of little knitted woodland animals in my head for awhile now and finally decided to make one! I think he turned out great... not completely fox-like, but cute nonetheless. Annie and I even had a fun little excursion to the beach to find the driftwood. She pointed out all the sticks. She likes sticks, I guess. I don't think I'll be stocking this type of item for shows this season, but I'd love to make more as custom orders! I really want to try making a skunk... what do you all think? which is currently turning into a drawing with will turn into a painting.